With some 50,000 migrants trapped in Greece, thanks to the closing of the "Balkan route," Frankfurter Allgemeine Zeitung is reporting that human traffickers are now offering trips to northern Europe along new routes. The phone numbers of traffickers are in Facebook. The migrants travel for days hidden below deck on a merchant ship, at the mercy of the weather. The new route leaves from southeast Turkey and reaches Greece without detection by the Nato patrols. From Greece they travel to Albania, and from there they can go north by car, or cross the Adriatic Sea to Italy. Another alternative route is through Bulgaria. Serbia's border is closed, so refugees go to Romania and the treacherous Carpathian mountains, and travel north along the border with Moldova to Ukraine and Poland. European officials are predicting that 500,000 to 800,000 migrants will arrive in Europe from Libya this year, now that the trip from Turkey through Greece has been effectively closed. On March 20, the EU-Turkey deal to send migrants back to Turkey came into effect, and the so-called "Balkan route" north from Greece was closed almost completely. Since then the number of migrants arriving in Greece has been falling sharply, with only 1,000 people arriving in all of last week, while there were 2,000 a day in previous weeks. At the same time, the number of migrants arriving from Libya has been increasing, albeit slowly so far. There were 13,829 registered arrivals so far this year, compared with 10,075 in the same period in 2015. But numbers are increasing rapidly as Italy's coast guard reported that it had rescued 1,482 migrants off the Libyan coast over the weekend. The stream of migrants is expected to grow quickly within the next month as the weather warms. 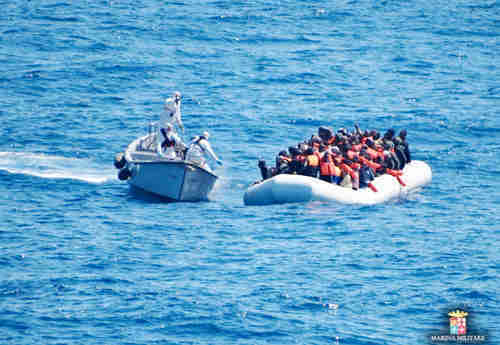 Once the migrants are in boats in the Mediterranean Sea, they head for Italy, but they're more likely to be stopped by any of a number of ships in Italy's navy and coast guard, or vessels with the Europe's Sophia and Frontex border control anti-people trafficking operations. A principal objective of these operations is to prevent shipwrecks and avoid disasters like the ones that saw 1,200 people drown over a few days in April last year. There are widespread fears that ISIS will use the growing flow of migrants from Libya to Europe to smuggle militants into Europe. Others discount this worry, saying that there are easier and less risky ways to smuggle militants into Europe. Once migrants arrive in Italy, they are allowed to apply for asylum, a process that can take as long as 18 months. During that period, Italy holds them in "reception centers." There are now 106,000 people in these centers.